It is bloom time again- the season of spring is here. Chaitra marks the first month of the solar calendar- an end to the winter chill and the onset of brighter days. The Indian subcontinent basically being an agricultural country also celebrates the harvest season of Rabi crops during this time. As cultural diversity dictates- this occasion is celebrated differently across various states. Where in the southern region the Spring New Year is known as Ugadi (Yugadi), the same is called Gudi Padwa in Maharashtra while the Sindhi community celebrates Cheti Chand. Vaishakhi, Bihu and Puthandu are also spring-harvest festivals of the northern, eastern and southern states respectively. The states of Karnataka, Telangana and Andhra Pradesh celebrate Ugadi as their New Year. Spring cleaning takes up most of the preparatory week while the New Year celebration entails colourful home decoration with rangoli and mango leaves. Pachadi is a special dish prepared for this day which is sweet, sour, salty, spicy, and bitter- putting every taste together to be ready for the ups and downs of life. 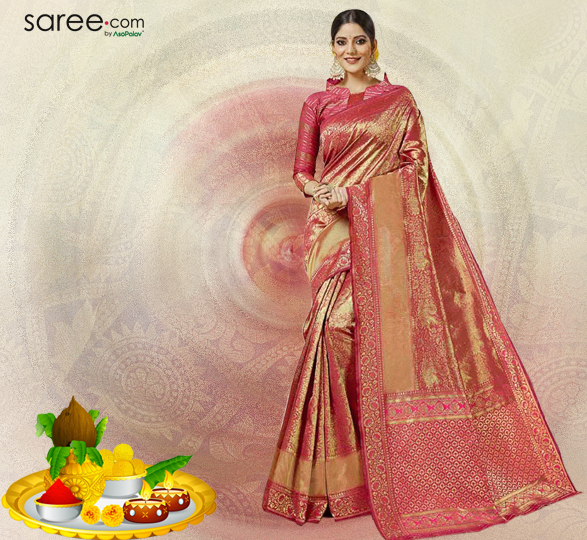 For women, it is the occasion to be dazzling in gorgeous silk sarees. 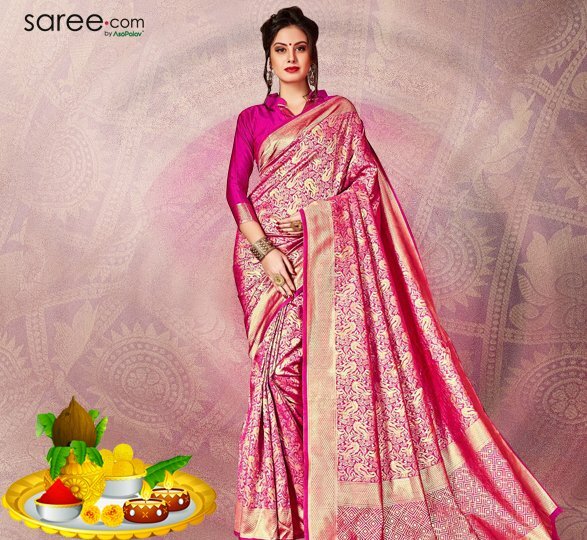 Mysore silk saris, Bangalore silk sarees and other south silks– ladies prefer pomp and vibrancy with colours and details. Gold jewellery forms an essential component of the festive ensemble, along with real flowers used as hair accessories. The rituals followed during Gudi Padwa are closely similar to Ugadi- it is the New Year of the Maharashtrian community. ‘Gudhi’ which is a set-up consisting of a special silk cloth placed over bamboo and topped with a metallic pot- is placed outside every home to bring in positive energy. Maharastrian women- especially the elite ones prefer wearing heavy handloom sarees and Paithani saris for the occasion. 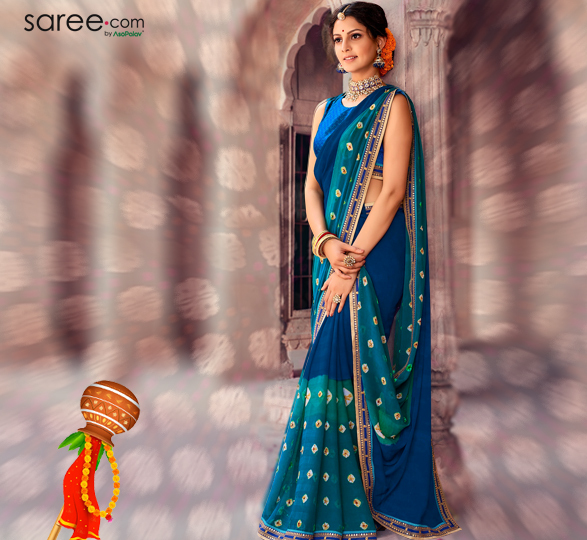 Ladies in general prefer colourful sarees with zari borders to match the festive vibe. 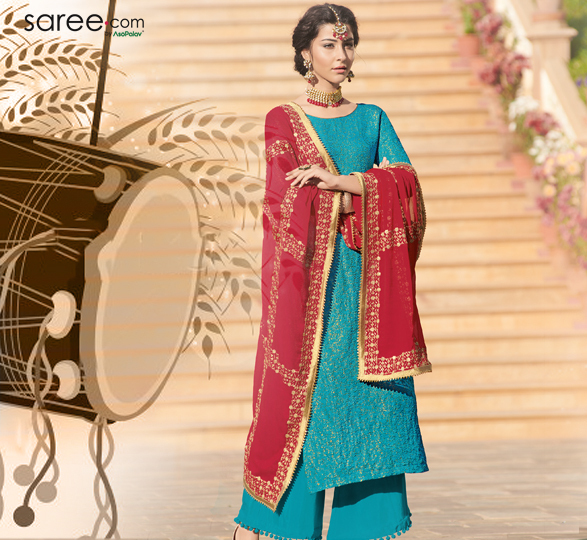 The ensemble is completed with a metallic nose-ring and lots of bangles. Street processions with folk music and dance scale up the enthusiasm among the community during this time. It is believed that Lord Brahma created the Universe on this day. A lot of other folklore is associated with Gudi Padwa that raises its significance- making it one of the most auspicious days of the year for the people of Maharashtra. A day that marks the birth of Jhulelal- Cheti Chand is the Sindhi New Year. It usually falls on the same day as Gudi Padwa and Ugadi. ‘Sarghas” is the street procession carried out on this day with the idol of Jhulelal and devotees dancing around to Sindhi folk songs. Taheree which is a sweet rice preparation is distributed as ‘prasad’. Looking their best is an important norm followed by women for every festival. For Cheti Chand, Sindhi women- especially the conservative ones prefer wearing sarees and salwar suits that are full of shimmer and dazzle. 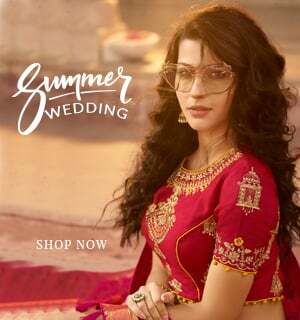 Young girls are seen decked up in lehenga cholis while fusion-wear like dhoti suits, jacket suits and even kurti palazzo sets are also sported by a number of women. ‘Waheguru Ji Ka Khalsa Waheguru Ji Ke Fateh!’ Vaisakhi- the spring harvest festival of Punjabis also marks the birth of the Khalsa community. Folk music, Bhangra and Giddha performances, funfairs and lots of merriment- the north Indians are known for putting their heart and energy into celebrating this joyous time of the year. The Golden temple witnesses a throng of devotees from across the globe. 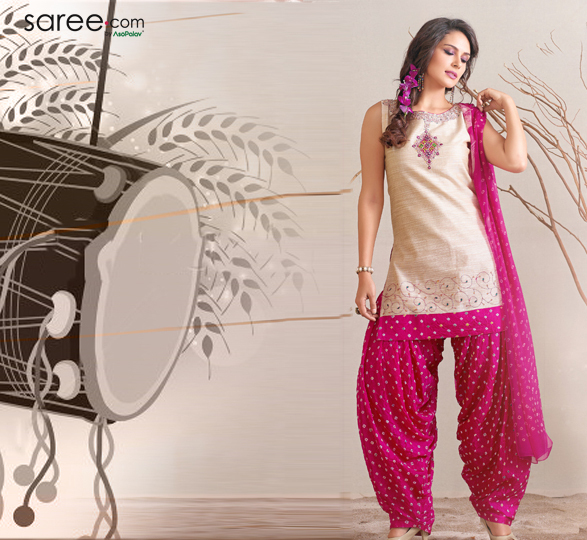 Women make efforts to look presentable in gorgeous salwar suits- which are traditionally North Indian attire. 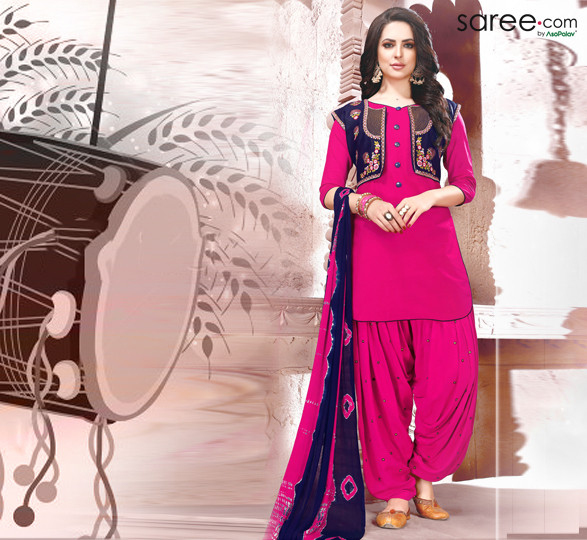 Patiala suits, Palazzo suits, traditional Punjabi suits, indo-western lehenga suits- every form of salwar suit can be spotted during this festival with brightness and effervescence dictating the colour palette. For the Sikh community, the festival of Vaisakhi holds greater significance because on this day, the 10th Guru of the religious group Guru Gobindh Singh laid down the foundation of the Khalsa group. This group comprised of warriors that stood against the Mughal emperors who were forcing Hindus to get converted to Islam. The spring harvest season which is celebrated as Vaisakhi in Punjab is known as Bihu in the eastern region of India. During this time, people offer their prayers to Lord Krishna and to the cattle. The celebration of Bihu extends to the states of Assam, Manipur and also to many South-East Asian countries like Thailand (Poi-Sangken festival) as well as in other parts of the world that has North-east Indian and South-east Asian communities. The people of Assam are deeply rooted to their culture and therefore their attire for Bihu mainly incudes traditional Assamese clothing. 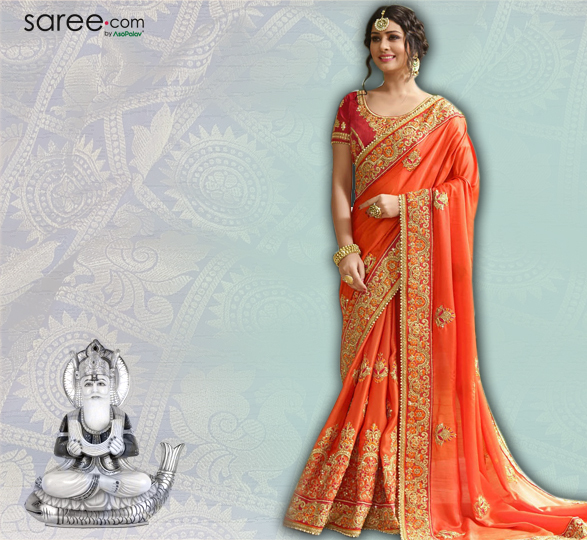 For women, the traditional dress is called Mekhela Chador and is draped around like a saree. 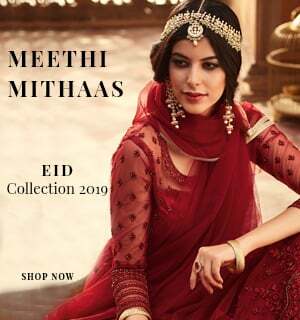 However, the major difference is that this is a two-piece garment, where the Mekhela is draped like the pleated section of a saree while the Chador is draped like a pallu. 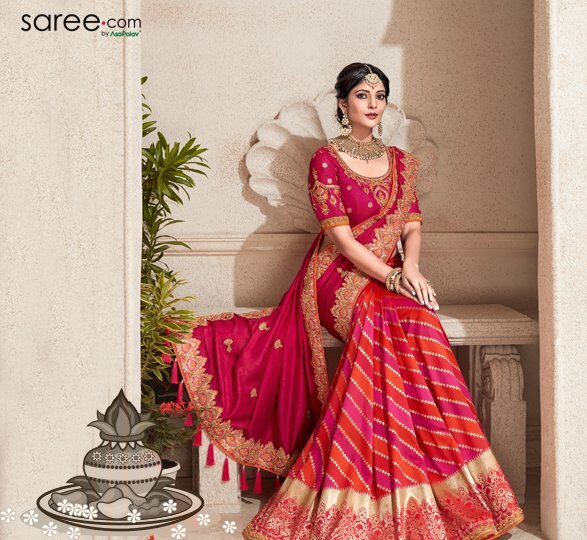 However with time, women have switched over to regular saris in silk, georgette and cotton silk as well as pre-stitched and contemporary saris. Tamil Nadu has its own version of the spring harvest festival which is known as Puthandu or Puthuvarusham. It is also celebrated with great zeal and fervour in other countries like Sri Lanka, Malaysia, Singapore, Mauritius and other places that have a substantial population of Tamilians. Visiting a temple and performing Puja is a significant routine followed on this day. 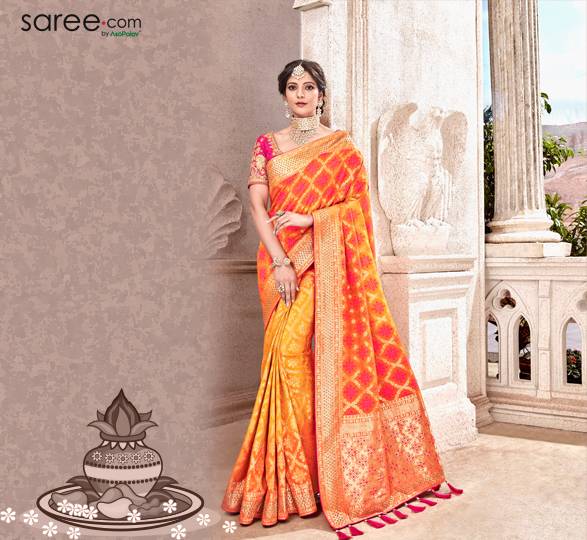 Tamil Nadu is well known for its range of high-end handloom silk sarees like Kanchipuram saris, Pochampally, Dharamvaram, Samudrika and Chennai silk saris. Rich colours and ornate borders made with golden zari threads as well as nature and temple inspired designs to form distinctive characteristics of these beautiful south-silk drapes. 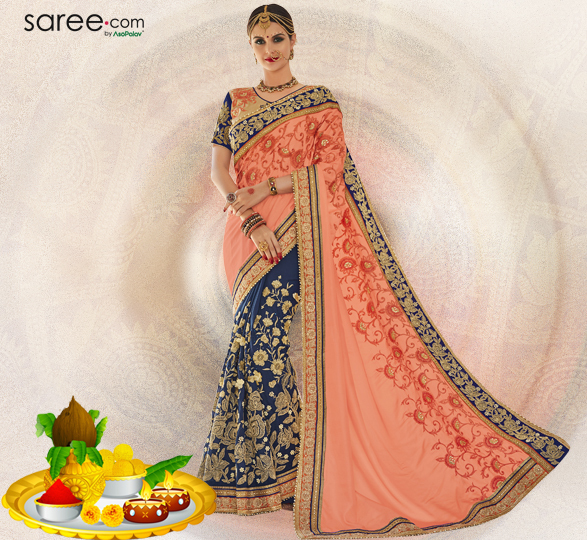 These traditional sarees are proudly flaunted by Tamil women during this time. 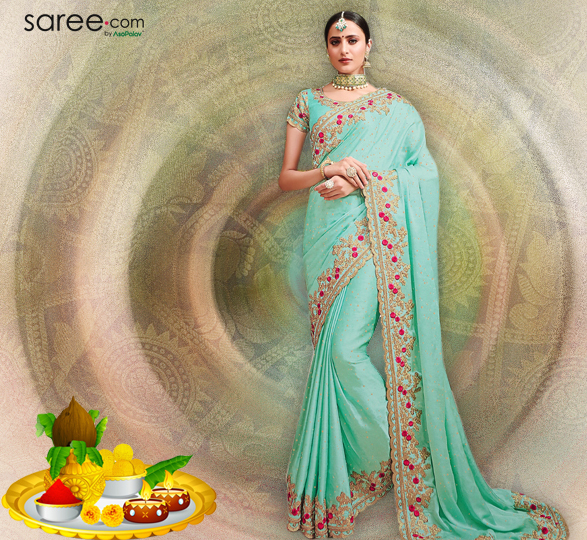 Art silk sarees have become popular-especially among people who have a fixed budget. 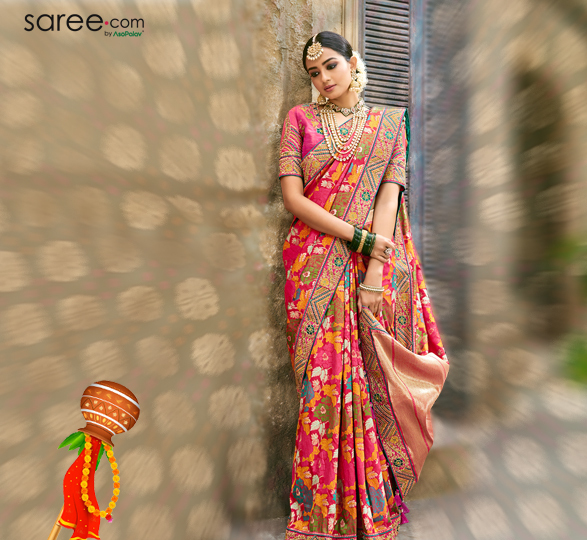 Kanchipuram art silk saris and other artificial variants of luxurious handloom sarees have largely invaded the market- making it easier for people to procure a new outfit for every festival. One occasion- many festivals- that’s the beauty of the Indian culture. While names, dress codes and festive routines may differ, the underlying idea remains the same- it is the celebration of a new beginning. Have a great spring-festive season!